Instant messaging is one of the most used communication services, and Adium is one of the best applications of this kind for Mac. It comes with a very refined interface and support for many networks. 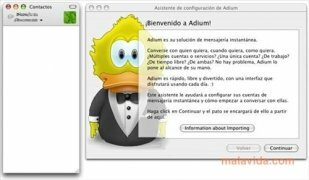 Adium allows you to connect to the AOL, ICQ, Jabber, GTalk, LiveJournal, MSN Messenger, Yahoo!, Bonjour, iChat, Myspace IM, Gadu-Gadu, Novell Groupwise, QQ or Lotus Sametime networks, among others, so it's almost impossible to find a network that isn't compatible with Adium. Like the majority of programs, it is possible to change our photo, organize the contacts by groups (hiding the ones that aren't connected),... furthermore, the conversations all open in the same window, where they are organized by tabs. It allows us to share files and liven up the conversations using emoticons or smilies. If the user chooses to allow it, Adium integrates into the system, specially with the agenda and it is compatible with Growl notifications. Furthermore, this software is so popular that many developers have created really interesting plug-ins and add-ons that expand its possibilities and can be found on the Internet.